You probably have heard of spray foam insulation, and you may have even used the foam that comes in pressured spray cans at hardware stores. This foam is known as one-part foam, meaning that it is one continuous mix that is simply applied to the area in need. One-part foam is frequently used for Air Sealing Your Home air sealing gaps and cracks. For large jobs, we use two-part foam, which comes in larger containers. With 2-part spray foam, it’s necessary to mix separate resin and catalyst compounds at the application nozzle. Combining these ingredients starts a chemical reaction that creates expanding foam. 2-part spray foam offers higher R-values for the wall, floor, and roofing assemblies. Spray foam provides an air barrier to wherever it is applied to help diminish air leakage from the home. A well-sealed envelope increases comfort, reduces noise from outside, lessens pollen, dust, and insects entering your home, and provides better humidity control. 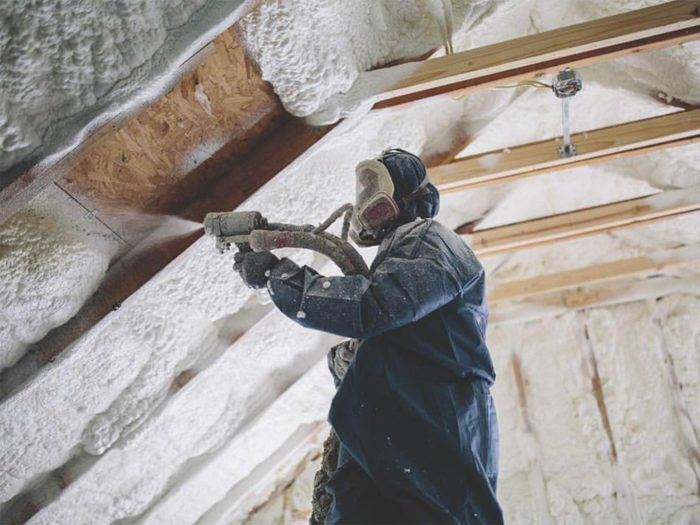 Spray foam insulation outperforms other insulation materials in terms of R-value, resistance to mold and moisture damage, durability, air sealing, and versatility. Before you decide on spray foam or another method of insulation, it’s important to understand the superiority of spray foam compared to traditional materials. When compared to fiberglass batts, spray foam offers nearly double the R-value per inch, achieves air-sealing and insulation in one step, won’t be damaged by mold or moisture, and won’t settle, compress, or otherwise be damaged to the point it needs replacement. Schedule a free quote today. Home Solutions of Iowa can improve your home’s efficiency with spray foam insulation. Check out what our happy Iowa homeowners have to say. Every crew that was here did a very good job, was very personable, helpful and the workmanship was superior! I really like my roof and gutters. Great job LeafGuard®. - John H.
You have the best installers that are here working their butts off and working against wasps in my gutters, I am so thankful and I don't normally call about things like this but I am so impressed. Thank you so much! - Mike H.
Everyone did a really nice job on our roof and gutters. The installers were very efficient, mannerly and did an excellent job of clean up! - Teena W.
Professional from the beginning to the end! - Scott B.